Who Wants My Money Now? Sometime last year I started getting emails from the Washington Times. For those of you not currently or previously drowning in politics (lucky you! ), the Washington Times is a right wing rag — Fox News in black and white (and read all over) by conservatives in Washington (and probably nowhere else — it’s a really rag and not in a good way). Ooh Boy Howdy! I can work long and hard to support a crazy man from Texas! Yee-Haw! OK, back to reality. You won’t be surprised that I didn’t send Ted my hard earned money, unless you have just clicked on this blog for the first time. Because I’m pretty sure that this one picture is worth a thousand words. Or dollars — Confederate or U.S. I clipped the photo montage from my friend, Father Kane, at The Last of the Millenniums, where I get so many great pictures. Filed under 2016, Campaigning, Crazy Folks Running, Elections, Huh?, Washington, WTF? I am sorry I am so uninformed to be able to poke fun with y’all. Mad magazine game had money too. I think there was a billion dollar bill with Alfred E Newman’s picture on it. Based on Monopoly, but the object is to lose all your money. fun game. Surely your heart must go out to the poor man – if he doesn’t receive these funds, he won’t meet the 2-week interim goal that he set! I get teary just thinking about it! I would much rather do that, Art. You would use it to try to be funny. He would use it to succeed at being evil. BIG DIFFERENCE! My dad was a lifelong registered Republican, although during my years of political awareness he has tended to vote Democrat more often than not. He switched registration a few years ago, finally having given up on the Grand Ol’ Party. But while he was so registered, we had a good time reading some of the stuff he got in the mail. I can’t imagine what it must be like now with the loonies that have taken over the party. My wife called from the other room and wants to know why I’m laughing so hard. I can’t wait to show this to her. You should have stuffed an envelope full of Monopoly money and mailed it in. Oh, it’s going to be a glorious campaign season. I emailed the picture as my reply. But I love the Monopoly money idea. I often mail back the empty envelopes so they have to pay postage. But your idea is brilliant! Did you ever read Abby Hoffman’s “Seal This Book?” For postage paid return addressees you don’t like very much, he suggests adhering the return reply to a brick. I am on the floor!!!! Best response E V A H to a WRONG freaking number…I’m still laughing at the photo … it’s so perfect. I am laughing down the inside of my thighs. Thank you for that one. 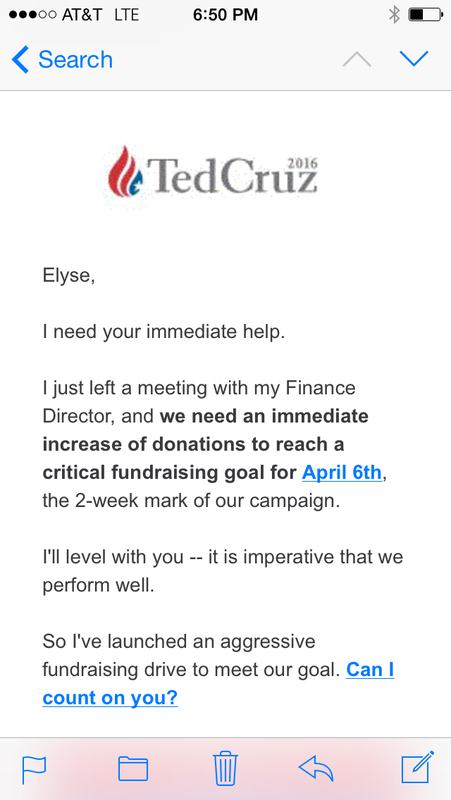 Gad, you get letters from Ted, how fortunate for you. You get to keep up with him. I on the other hand, despite being a Texan (of longer heritage than him by the way), am blocked from his Facebook page and other social media sites of his, do you think it was something I said? I am sure it was something you said. Obviously, unlike you, I am not getting my opinions expressed adequately! I have some Canadian Tire money.. Fork it over. I’m sure Teddy Boy will take it. Well, if 1 picture is worth 1,000 words, these 3 pictures have to be worth the price of admission to one of his desperate fund raisers–just for more blog material, mind you…Of course, you might have to pledge allegiance to some cray-cray notions about the second amendment and freedom (but only if he can control you). I doubt he would appreciate the picture, but I sent it nevertheless. I love how his logo is the US flag going up in flames. I hadn’t thought of that. I thought it was a tear drop, as in Weep America. I’m donating all my millions of Monopoly money to Ted. Trust me, it’s just as real as Ted’s facts. You’ll have to add little Confederate flags into Mr. Monopoly’s hands, I think. Also Cuban and Canadian flags, just for Ted. And does hell have a flag? Cause he’ll need that one too. I don’t get the emails, I just get the actual mail. Red county in lilac state. i may have to highlight some of the “best of” in a future post, thx for the idea! Sure thing. There will be many posts between now and November 2016, I’m sure! That photo equation is hilarious Elyse. I hope you don’t mind if i steal the idea – I could have a lot of fun with that. American politics never ceases to amaze me. Within 2 minutes of seeing Palin speak the first time, there was no doubt in my mind that she was ill equipped to be the commander in Chief of the most powerful military in the world. Palin in charge of nuclear codes? Dear Lord help us please. how could anyone fail to see that? Since I stole the photo (with appropriate credit, of course), you are welcome to steal the idea, Paul. I can’t wait to see the results. John McCain will be residing in a special level of hell for bringing Sarah Palin into the public eye — let along consider her qualified to touch THE button. I saw that! I did a lot of smuggling when I loved in Europe — you really had me with that story! Ha! there is an art to it, and a mysterious attraction. It gets the adrenaline rushing. glad you enjoyed it. thanks so much for the read. Great imagery there (Nixon, Granpa Munster, and Ted Cruz). Nixon’s dead. Granpa Munster is a fictional character. And Ted Cruz — he’s just batshit crazy. He really is, isn’t he. I do not understand how he got elected to anything, let alone the US Senate. When did politicians get to stop being likeable? WTF? I just don’t get it. When voters stopped understanding issues and paid attention only to sound bites and spins. That’s a striking set of pictures. Maybe there’s some secret clone lab that actually produced Cruz out of Nixon and Munster DNA. He would definitely be par for the course as a VP candidate, from the party that brought us such unforgettables like Nixon, Agnew, Quayle, and Cheney. It’s a little scary. Yes! As I said to Carrie down below, if he is VP candidate, I would want a really good food tester for the prez should the GOP win in 2016. God help us all. I nominate Cruz to be the food tester. As a Texan, I take offense. Grandpa Munster was a wise man, and although prone to ridiculous experiments with disastrous results, he should not be compared to Ted Cruz, (yet another ridiculous man with disastrous results). At least Grandpa Munster had a viable excuse – he was FICTIONAL, and a vampire, and meant to be humorous, and funny. Ted Cruz? Not so much. I’d be inclined to vote for grandpa over any actually IN the GOP! My soul is worth far more than that. I actually fear he might become the GOP VP candidate. Then if they win, Jeb will need a food tester. A food tester? I bet that will come with hazardous premium pay! That was my first thought after hearing Sarah Palin’s 2008 convention speech, too! They do pick some scary folks. Still can’t believe they picked her. Of course she didn’t have much exposure yet and of course she could see Russia.